I’d had a set of Holden 3.3-litre Blue motor extractors for sale on a few Facebook pages and a bloke named Brod made an enquiry. Unfortunately for Brod I’d sold them (I forgot to take-down the ad) but we got into a bit of an on-line chat about our cars. It turns out that Brod had just bought a VH Commodore SL to restore. With all the Brocks in collections and the prices of any other upper-spec Commodore now beyond the reach of many enthusiasts (top-spec V8 SL/Es are now $25K-plus) the more modest model Commodores such as Brod’s SL (and of course same-era Falcon GLs and S-packs) are being snapped up by people – like me – who want to cruise and enjoy their own little piece of Aussie iconic-ness. Anyhow, the pics Brod shared with me showed a car with the bumpers and panels straight. All its bits were there, except for one door handle and the side rub strips. To be beautiful again, this humble SL needed fresh metallic brown paint and Brod told me of his plans to have a local ‘old feller’ (I assume a retired paint ‘n’ panel man) perform what many car nuts call a ‘closed door respray’. This is an effective and popular way to get an older car looking good again without too much expense. 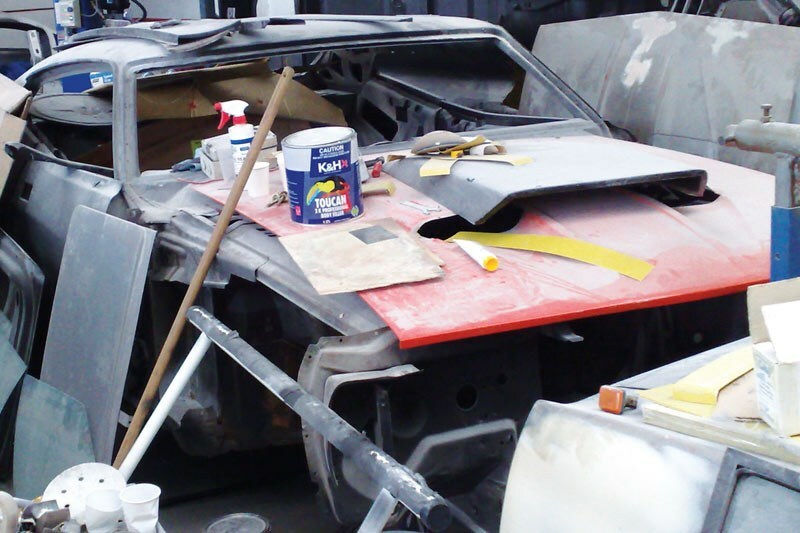 The car is partially disassembled; some components masked and fresh colour applied just to the exterior, leaving areas such as the door jambs, in the boot and under the bonnet – where chances are the paint is still in good condition – original. The result is a good-looking car without a complete labour-intensive, expensive, interior-and-screens- out disassembly. Alarms began ringing in my head. As a long-time enthusiast, I’ve heard horror stories about ‘take-ya-time’ resprays and restorations even by businesses. The work often begins with a flurry of activity as the car is disassembled. The keen owner, who has droppedin for a look after a week or three, leaves with a beaming smile, happy that progress is being made. But over the next few months, the car drops down the shop’s priority list as more – and more lucrative – crash work comes in. The project is pushed into a work bay and stuff stacked on top. The owner becomes progressively more frustrated as progressively less work appears to be done. Eventually after a year or two the heartbroken owner gets the shits and arrives with a trailer to collect his unfinished project, only to find it rusting in the shop backyard with half the panels and rare parts missing. I’ve even heard of whole cars disappearing… Of course, there is also the situation where the owner has let the shop down, too, through lack of contact or – more likely – lack of cash. I suggested to Brod that he remove items such as the grille, bumpers and lights himself – and carefully bag and store them at home. At least they won’t be lost; he can save a few bucks and have a bit of on-the-tools fun. Brod did write that he’d provided only half the agreed $2500 fee – to allow the painter to buy materials - and mentioned he’d collect the car after six months if it wasn’t completed by then. Good call, and I hope Brod will be cruising his SL next summer.